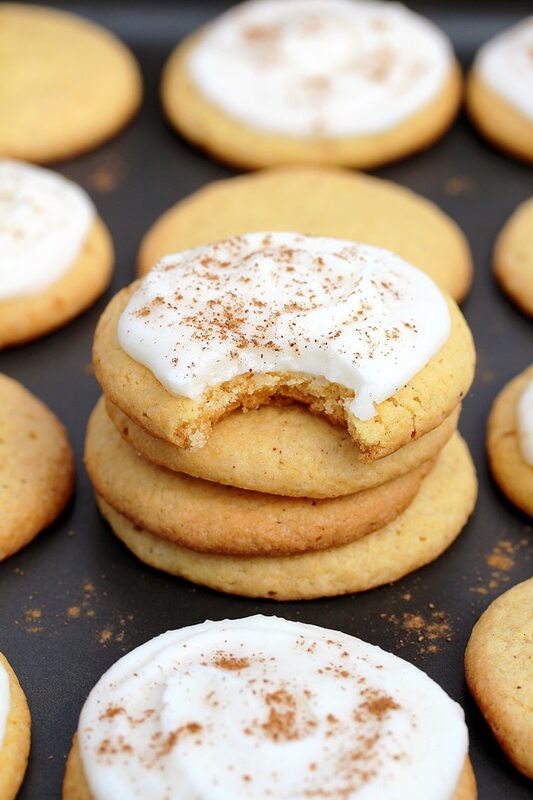 Pumpkin Sugar Cookies with Cream Cheese Frosting – these crunchy sugar cookies with pumpkin and cream cheese frosting are perfect for fall and upcoming holidays, like Thanksgiving. I love fall, especially in my kitchen, because I really enjoy making apple and pumpkin desserts. I like cinnamon, nutmeg and ginger, so they can always be found in my fall recipes. I enjoy when my kitchen smells of them. I enjoy making cookies. 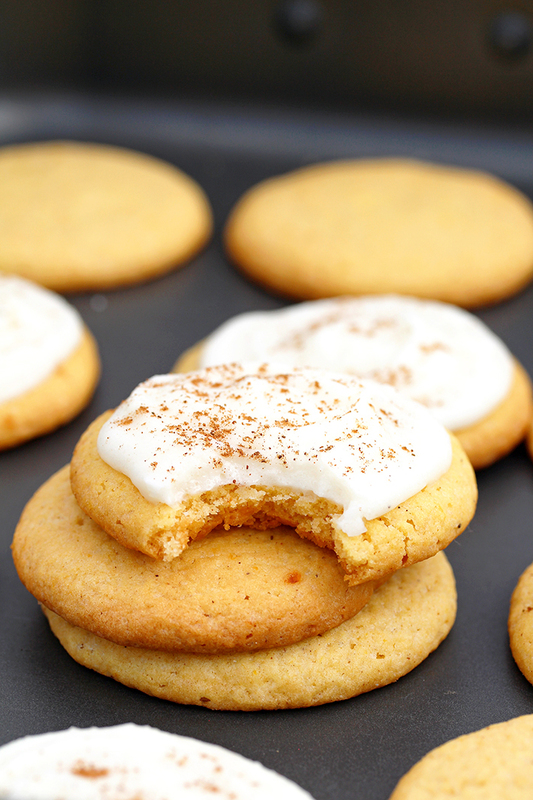 Pumpkin Sugar Cookies with Cream Cheese Frosting are one of my family’s favorite fall desserts. They are so quick and easy to prepare and you get looooots of cookies. You can enjoy consuming them for a few days. You will need some standard ingredients like: flour, sugar, baking powder, spices, butter, egg, vanilla, pumpkin puree and my secret ingredient – cornstarch, for finer texture. Cream cheese frosting gives them richer taste. 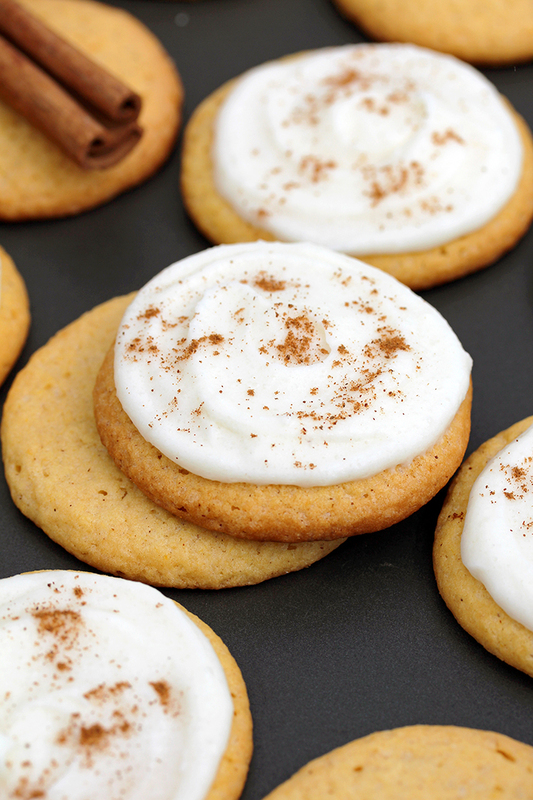 Crunchy cookies + creamy frosting = perfection. Besides cream cheese, you will need butter, powdered sugar and vanilla for the perfect frosting. 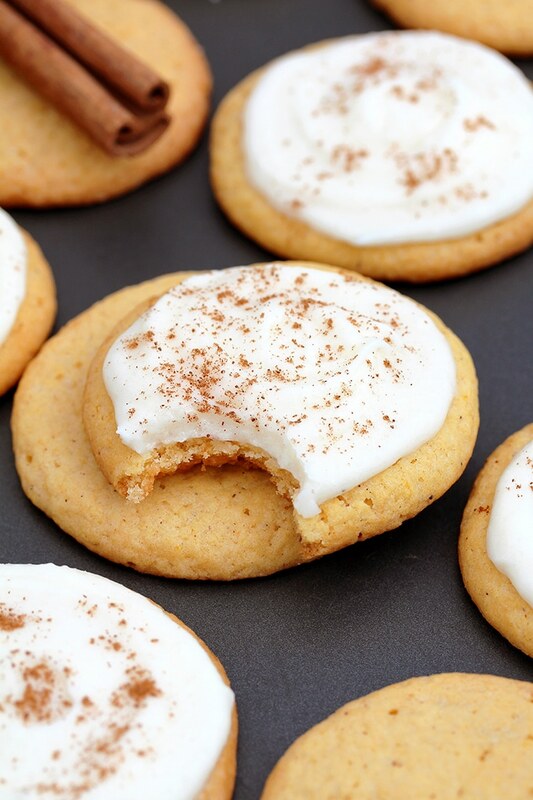 Pumpkin Sugar Cookies with Cream Cheese Frosting will be a great dessert for your Thanksgiving dinner. 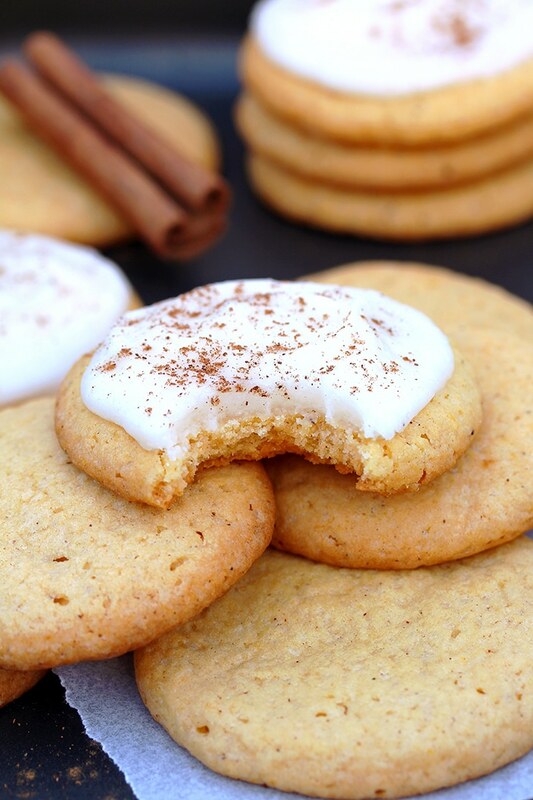 You can also prepare them without frosting and get crunchy pumpkin sugar cookies. If you wish them to be extra sweet, roll the balls in sugar before baking. All cookie fans should check out the most popular cookies recipes on our blog Chocolate Chip Cheesecake Cookies, Christmas Sugar Cookies with Cream Cheese Frosting and Holiday Maraschino Cherry Shortbread Cookies. 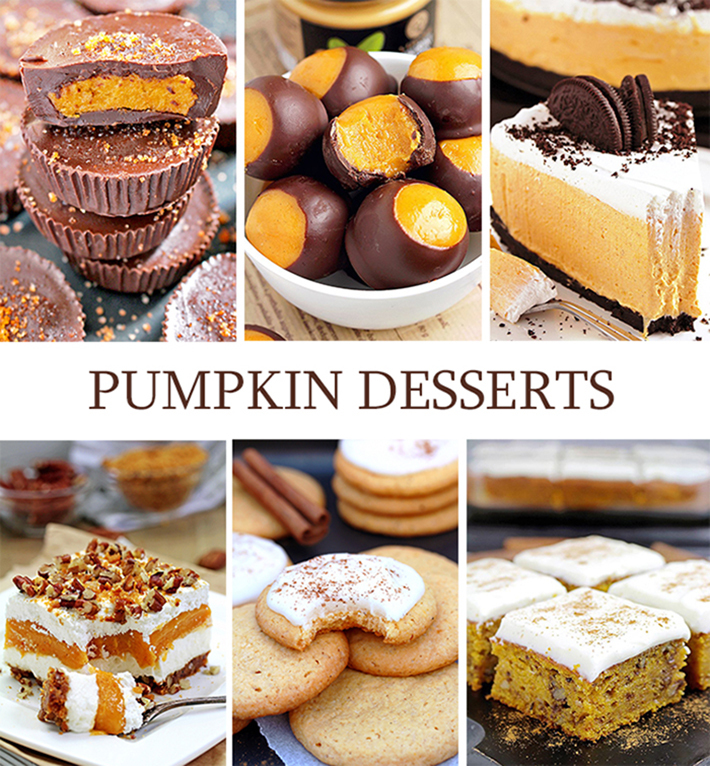 If you like pumpkin, check out the most popular pumpkin recipes on our blog No Bake Pumpkin Oreo Cheesecake, Pumpkin Walnut Bars with Cream Cheese Frosting and Easy Pumpkin Oatmeal Cups. 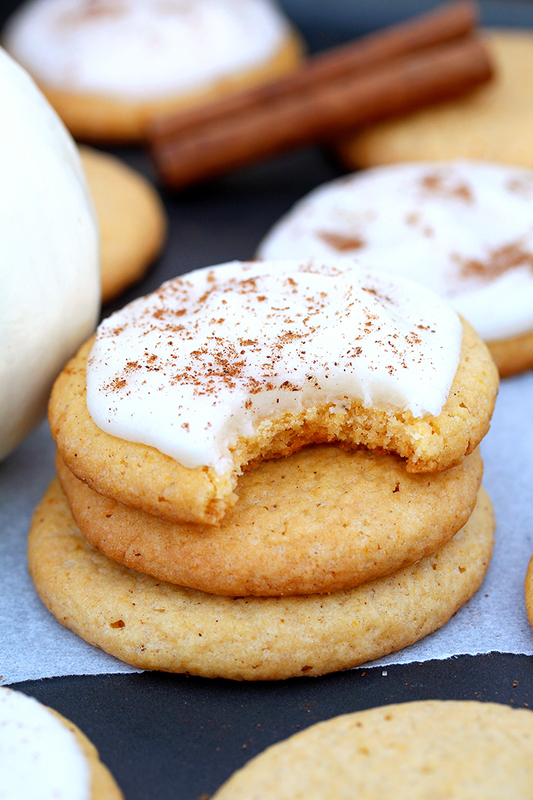 Sugar cookies and cream cheese frosting are my favorite, so that makes Pumpkin Sugar Cookies with Cream Cheese Frosting my number one. Try them and enjoy their amazing taste! 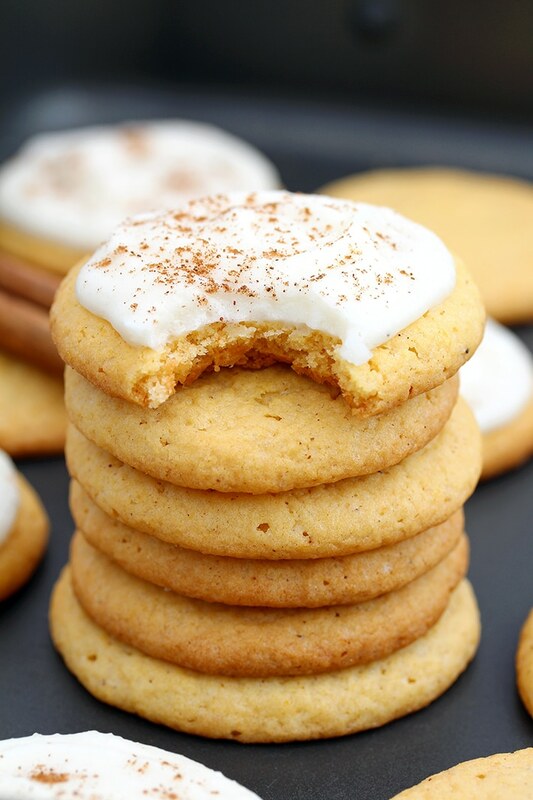 Pumpkin Sugar Cookies with Cream Cheese Frosting - these crunchy sugar cookies with pumpkin and cream cheese frosting are perfect for fall and upcoming holidays, like Thanksgiving. In a large dish combine flour, cornstarch, baking powder, cinnamon, nutmeg, ginger and salt. Set aside. In another large dish beat butter and sugar, at high speed, until light and fluffy. Add egg yolk and vanilla and continue beating at medium speed, until smooth. Add pumpkin and beat until well combined. Lower the speed while adding dry ingredients until you get fine dough. Cover with plastic foliage and cool for 20 min. Line baking sheet with parchment paper. Preheat the oven to 350 F. Take the dough out of the fridge and roll the balls from a tablespoon of dough. Place them on the baking sheet and press each one of them. Bake for 15 minutes or until the edges become brown. Take out of the oven and leave for a few minutes in the baking sheet, then transfer to a wire rack to cool completely. In medium dish beat butter, cream cheese and vanilla until smooth. Add powdered sugar and beat until well combined. Spread the filling evenly on the cooled cookies and sprinkle with cinnamon. If you wish them to be extra sweet, roll the balls in sugar before baking. Keep in a well sealed container, refrigerated, up to 5 days. Thanks Linda, you can subscribe and you will receive new recipes through e-mail.